The TREE HRB103, HRB203 and HRB303 are great milligram balances. Perfect fot basic lab use. 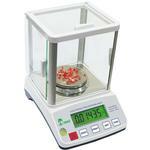 Has a 0.8 inch LCD display with a backlight, Has 3 Capacitys 100g 200g and 300g Glass Draft Shield and RS232C.